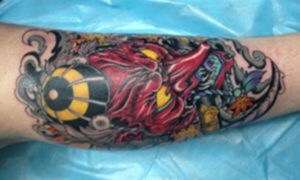 Cover Up Tattoos by the Skin Factory, the best Las Vegas Tattoo Shops. Sometimes, what seems like a good idea in the moment doesn’t stand the test of time. If this has happened to you with a tattoo, there are two options. One option is to find someone with laser tattoo removal expertise. The other option is to cover up the existing tattoo with something more tasteful or fitting. 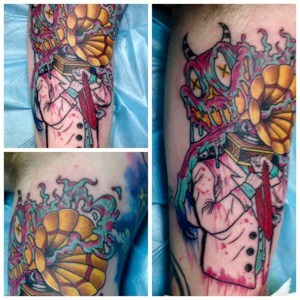 Here are three things to keep in mind when considering a tattoo cover-up. Creating a cover-up tattoo is more difficult than working with clean skin. Because of this, it’s important to find a tattoo artist who has experience with cover-ups. You need someone who can assess the area and existing tattoo to determine the best way to design, place, and ink the new tattoo. Simply put, the new tattoo will be bigger than whatever hiding beneath it. A larger design makes it easier to mask the old tattoo and will also give you more possibilities; the bigger the artwork, more detail can be put into it. Your artist will be able to help you choose an appropriate style and size. Deep colors like blues, browns, and blacks do a good job of concealing old tattoos because the darker (and more vibrant) the new tattoo, the better it will be at masking the old tattoo. In some instances, if your existing tattoo is very dark, it may be necessary to schedule a few laser removal sessions prior to the cover-up. This will ensure that your cover-up is completely successful. The effectiveness of a cover up depends on the size, colors, and shape of the existing tattoo, but a skilled tattoo artist can help you find a design that works best with the existing tattoo without compromising your vision for what the new art will look like. If you regret your first tattoo, we can help give you something new to be proud of, or help you get rid of it completely. Contact us to schedule a consultation to work with one of our Las Vegas Tattoo Artists. Call 702 435 1149.